Miss Grand International, Lees Garcia, is loving life in Bangkok. Attacked by a dog as a four year old little girl growing up in Puerto Rico, Lees Garcia required stitches to patch up her torn face, yet 23 years later was crowned Miss Grand International at a glittering ceremony in Thailand. As ‘against the odds,’ inspirational stories go, this is right up there. Today, 28 year old Lees is mid-way through her reign, living in a Bangkok apartment that came with the win. The Miss Grand International (MGI) pageant is new, just two years old, but it’s growing and the Thai organisers have high ambitions for it to become one of the most prestigious events on the global pageantry calendar. The inaugural competition (2013) attracted entrants from 75 countries. Last year’s competition (October 2014) saw ladies from 85 countries compete, with Lees, representing Cuba, crowned ‘queen’ after a month of events. 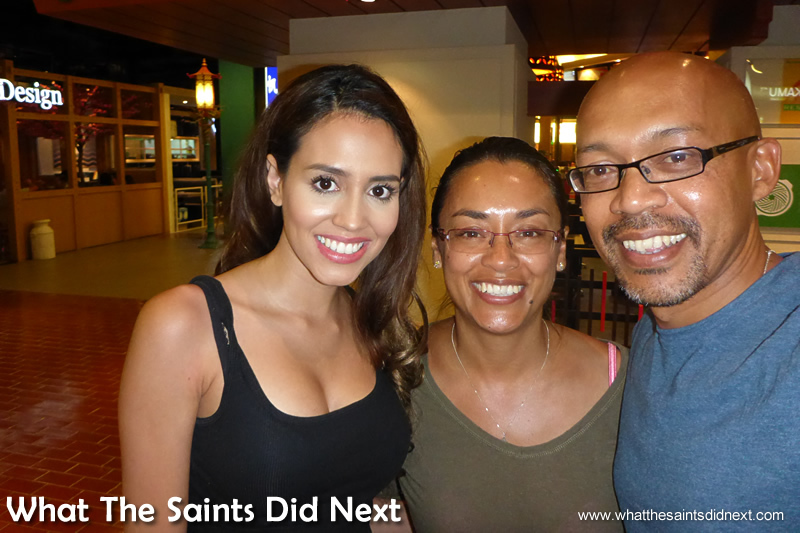 Meeting Lees at the Phra Khanong BTS station, in the heart of Bangkok, our first impression is definitely, “wow!” Effortlessly oozing beauty queen glamour, she greets Sharon and I with a mega-watt smile and we are all instantly at ease, chatting away as we walk to a nearby coffee shop. Lees took a little while to adapt to the Bangkok lifestyle. Traffic is always a challenge. 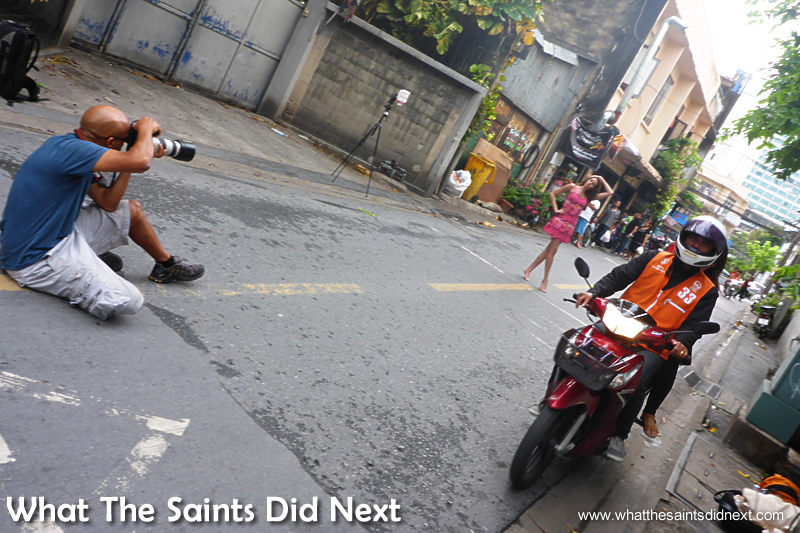 We managed to keep shooting as the scooters drove around us – only in Bangkok! 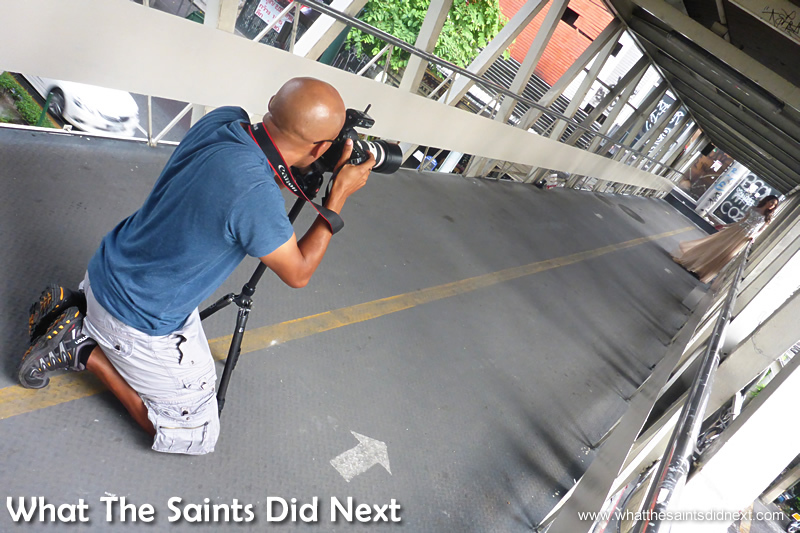 Lees Garcia adding plenty of glamour to the Bangkok streets and generating plenty of interest from curious locals. She may be gushing now, but for Lees, her Bangkok story has also been testing. “Well I’ll give you the stages of my adoption,” she says, explaining that first it was easy; a month in Thailand with the other contestants, having fun being well looked after without considering she might win. But then everything changed overnight. Working on how to frame the next shot. Bangkok was a difficult place for Lees to begin with, but now it’s really beginning to feel like home. Suitably motivated, Lees began meeting people and making friends who in turn helped her learn the Bangkok way. In just three weeks she was finding her feet and enjoying it. When her pre-planned Florida holiday came round in December she didn’t want to leave. “It was the saddest,” she recalls. 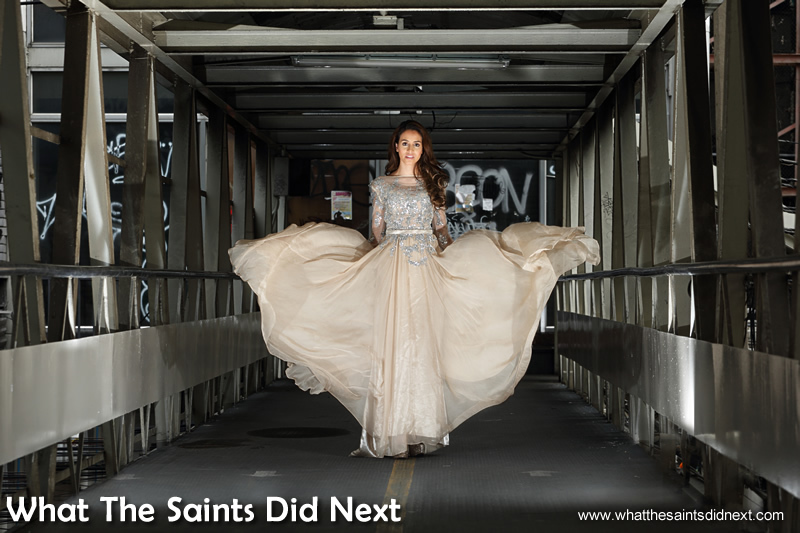 Our second look was shot on a commuter walkway bridge, over the street. The noise from the traffic below was almost deafening at times. 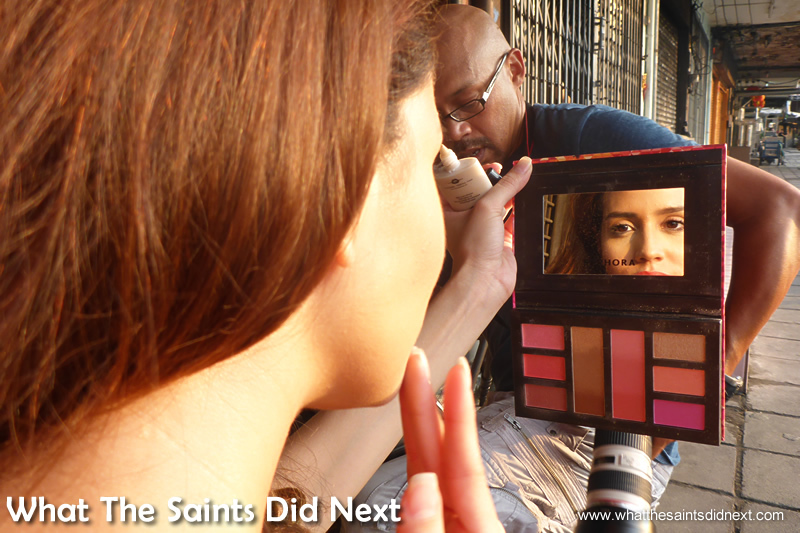 Miss Grand International, Lees Garcia, street photo-shoot, Bangkok, Thailand. Miss Grand International, Lees Garcia, in Bangkok. Lees’ time is now split between fulfilling her MGI contractual obligations and plotting a course for life after she relinquishes her crown to a new MGI queen in October. For MGI she carries out promotional appearances, advertising for sponsors, charity work and modelling. The non-stop energy of Bangkok’s streets makes for an ever changing backdrop. 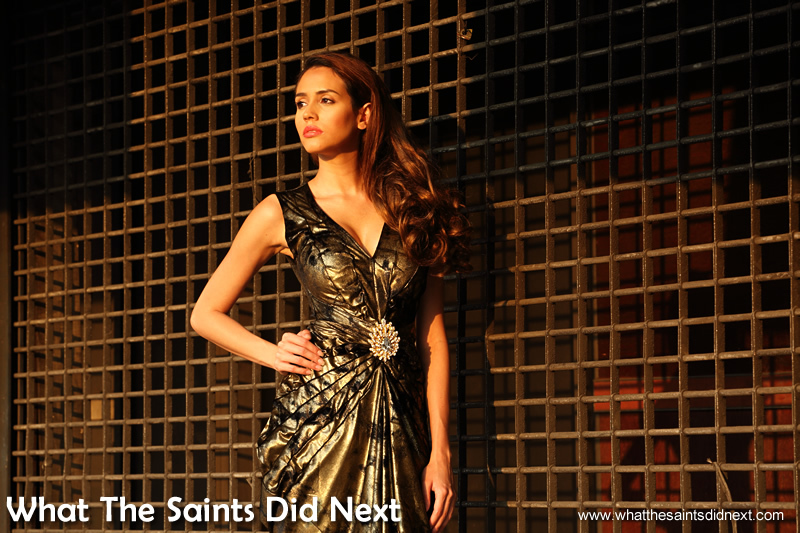 Lees Garcia wants to continue living in Bangkok after her year as Miss Grand International is complete. In her own time Lees is busy trying to ascertain the viability of remaining in Bangkok, post MGI, as a model and preferably a TV presenter. Before meeting us today she had attended a TV screening (interview). Ten years ago Lees studied communications at college with dreams of finding TV work. A series of turns led to an unsuccessful interview for presenting TV weather at age 21. “Looking back at my baby faced pictures I think, poor thing! I know now that I wasn’t ready.” Hopefully this time around the timing is better. Quizzed on the best thing about Bangkok; “Is it bad to say the nightlife,” laughs Lees. “If you’re a night owl like me, Bangkok is great, everything functions through the night – markets, shops – here everything is unlimited all hours, that’s the most exciting part, you’re not restricted. I think it’s amazing. I definitely want to stay beyond my contract. Having adapted to the city, Lees is now walking tall in Bangkok. Another shoot is nearly over and it’s been good fun. Conversation is always very animated when excitable people get together! We leave the coffee shop to go shoot some pictures in the nearby streets, but truthfully we could have sat and chatted for hours. When we met Lees an hour earlier our impression was “wow, beauty queen,” but now it’s all about personality. She’s comes across as very open, not taking herself too seriously and very enthusiastic about life; our interview was full of laughter with the conversation constantly going off in all directions. But there’s also a determined intelligence that belies Lees’ beauty queen looks; a realisation that success is not a given and that even setbacks can be opportunities in disguise. A perfect example is the MGI competition. Originally Lees had entered hoping to represent the USA but was unsuccessful. However, the Cuban [manager] then approached her about representing Cuba, having watched her performance. Her father is Cuban. The politics of Cuba prevents girls from the island attending such competitions. 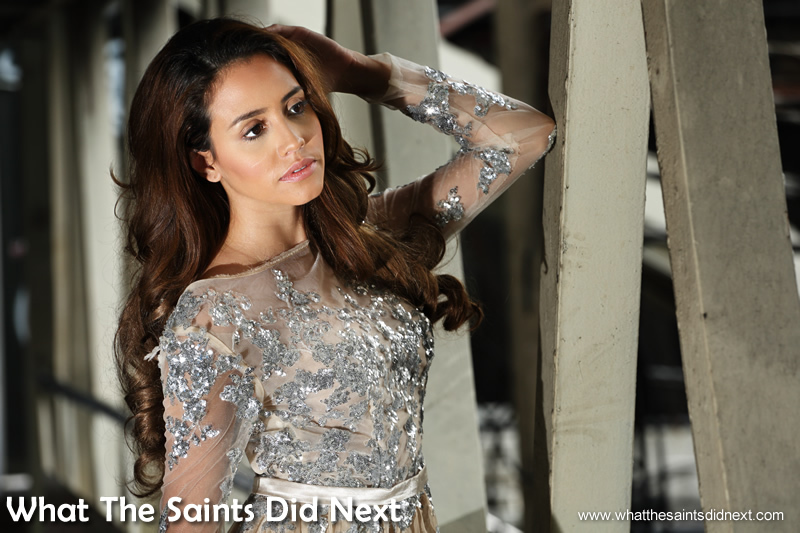 Lees went on to become Miss Grand International 2014. As for her love affair with Bangkok? That’s something we are beginning to understand all too well ourselves. Lees, Sharon and myself, the three of us easily converted to the Bangkok lifestyle. Thanks for the comment Toffy. Glad you like the pictures, Lees is certainly a very beautiful model to photograph. Bangkok is amazing, we love it. Thanks guys. Yes, the world is full of amazing people. Our day with Lees was brilliant, so much fun makes me wonder how we managed to get a shoot done! We love the sun too 🙂 can’t get enough! Really enjoyable story and the pictures are so detail as always. I think you both could live the Bangkok for some time. Thanks Borbs, Bangkok really gets under your skin, it’s a super city. We definitely could stay here for a while 🙂 Thanks for the comment. South East Asia, amazing countries and such beautiful people. Just pick one and come with an open mind, you can’t go wrong, so much to discover 🙂 Thanks for the feedback.